The revised edition has new reminiscences by Swami Yogananda, Swami Subodhananda, Ramendra Sundar Bhattacharya, Narayan Chandra Ghosh, and Trailokya Nath Dev, as well as additional information in Ramlal Chattopadhyay’s chapter. These new, eyewitness accounts are not found in Sri Ramakrishna and His Divine Play or The Gospel of Sri Ramakrishna. A total of 45 reminiscences by persons who knew him, show vividly how Sri Ramakrishna lived daily the spiritual message he taught, and how he excelled in opening a path for God into the human heart. 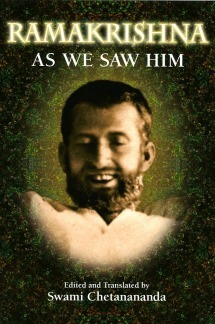 The soul of Ramakrishna comes through splendidly in these deeply felt pages. For the first time I found a man who dared to say that he had seen God, that religion was a reality to be felt, to be sensed in an infinitely more intense way than we can sense the world.” So said Swami Vivekananda of Sri Ramakrishna. 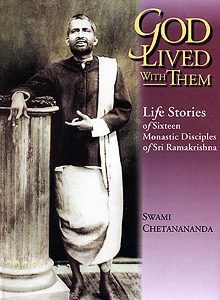 Ramakrishna as We Saw Him is a collection of writings by 45 persons who actually knew him in one capacity or another: his wife Sri Sarada Devi, monastic disciples, friends, even acquaintances who had met him only a few times. No matter in what category the writer falls, each makes it very clear that Ramakrishna could, by his very presence, affect fundamental change in a person’s spiritual life. 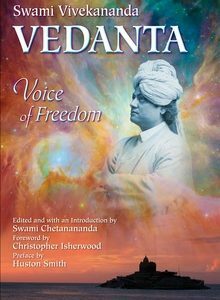 Chetanananda’s meticulously researched, lucidly written encounters — ranging from Vivekananda to M. (the recorder of the Gospel) and beyond — evoke the encompassing love of the Master as the core of all spirituality. No wonder one of these admirers describes Sri Ramakrishna’s company as sheer ‘fun’. 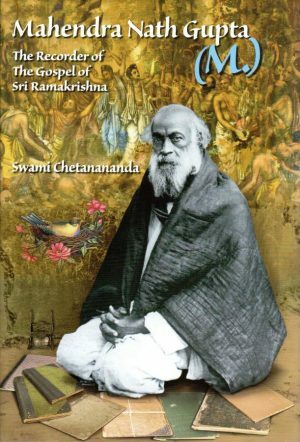 Chetanananda’s vivid, exquisite art of narration makes the readers see the myriad aspects of this joy which the disciples saw as the essence of their Master’s life itself: an evident affirmation of what he, with such disarming simplicity, taught. What this book serves is to show, as close as we can after the fact, what it was like to actually be around this unique man, to talk to him, to serve him food, to play with him, to sing and dance with him, to worship him, to cry with him, to celebrate God with him. Indeed, the feeling of spiritual joy is so strong here that, though he died from cancer of the throat, the life of Sri Ramakrishna seems to be the ultimate happy movie, a true story of perfect love and bliss many times more beautiful than the wildest Hollywood fantasy. When I was a little boy and had some knowledge about the world, I would think: “This world is not my home.” While watching the sky, I felt that I had come here from one of those higher starry realms. When my friends invited me to play with them, I felt that they did not belong to me and that my real playmates were in that higher realm. So I was reluctant to play with them. Then an indistinct dream world would manifest in my mind. So quite often I was unmindful and indifferent to this world. I heard the name of Sri Ramakrishna in my boyhood days, and I saw him many times in Rasmani’s temple garden from a distance. But I didn’t dare enter his room because of the large crowd. After bathing in the Ganges, I would pick some flowers and return home. However, I always felt a desire to be with the Master. From my boyhood I had no attraction for worldly things, but I had a natural affinity for the deities. After I was initiated in the sacred thread ceremony, I used to go to pick flowers regularly in the temple garden. Subodh and his friend Kshirod first visited Ramakrishna at Dakshineswar in August 1885. They entered the room and saluted him with folded hands. Kshirod approached the Master, who was seated on his bed, but Subodh remained by the door. “Where do you come from?” asked Ramakrishna. Pointing to Subodh, the Master said: “Why is that gentleman standing so far away? Come nearer.” This encouraged Subodh to move closer. 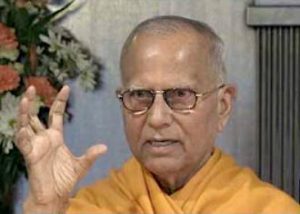 “Do you not belong to the family of Shankar Ghosh?” asked the Master. Once I spent the night at Dakshineswar with several other disciples, and the Master had us all sit for meditation. While communing with our Chosen Deities, we often laughed and wept in ecstasy. The pure joy we experienced in those boyhood days cannot be expressed in words. Whenever I approached the Master he would invariably ask me, “Did you shed tears at the time of prayer or meditation?” And one day when I answered yes to this, how happy he was! “Tears of repentance or sorrow flow from the corners of the eyes nearest the nose,” he said, “and those of joy from the outer corners of the eyes.” Suddenly the Master asked me, “Do you know how to pray?” Saying this he flung his hands and feet about restlessly – like a little child impatient for its mother. Then he cried out: “Mother dear, grant me knowledge and devotion. I don’t want anything else. I can’t live without you.” While thus teaching us how to pray, he looked just like a small boy. Profuse tears rolled down his chest, and he passed into deep samadhi. I was convinced that the Master did that for my sake. Another day I went in the afternoon to visit the Master at Dakshineswar. Many devotees were seated in his room. After saluting the Master I sat quietly in a corner. The Master was conversing with the devotees seated on his small cot. In physical appearance he was like any other man, but his smile was something divine. I have never seen such a smile in my life. When he smiled, a wave of bliss rolled not only over his face but over his whole body. And that blissful smile would wipe out the worries and troubles of those who looked at him. His voice was so sweet and melodious that one never tired of hearing it. His eyes were keen and bright, and when he would look at a person, it seemed that he was seeing everything inside him.